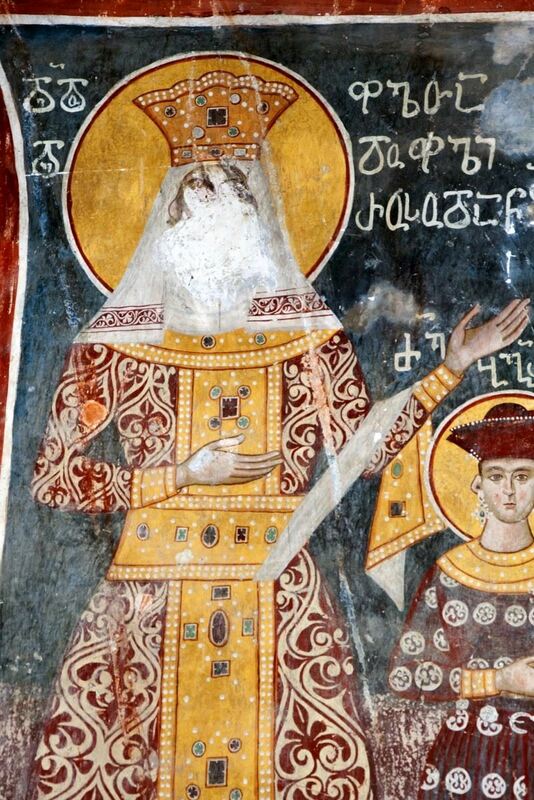 Rusudan, a member of the Bagrationi dynasty, ruled as Queen Regnant of Georgia in 1223–1245. She was known as a beautiful woman devoted to pleasure, whose hand was sought by her Muslim neighbors. In Muslim sources, such as Ata-Malik Juvayni, Rusudan was known as Qiz-Malik, from the Turkish qiz, "maiden", and the Arabic malik, "king". In the autumn of 1225, Georgia was attacked by the Khwarezmian shah Jelal ad-Din Mingburnu, pursued by the Mongols. The Georgians suffered bitter defeat at the Battle of Garni, and the royal court with Queen Rusudan moved to Kutaisi, when the Georgian capital Tbilisi was besieged by the Khwarezmians. Rusudan made an alliance with the neighbouring Seljuk rulers of Rüm and Ahlat, but the Georgians were routed by the Khwarezmians at Bolnisi, before the allies could arrive (1228). The Khwarezmians were superseded by the Mongols. They advanced into Georgia in 1235. Devastated and plundered by Jelal ad-Din’s incursions, Georgia surrendered without any serious resistance. By 1240 all the country was under the Mongol yoke. Rusudan sent her son David VI of Georgia to the Mongol court to get his official recognition as heir apparent. She died in 1245, still waiting for her son to return. Obverse: Bust of Christ,wearing nimbus, pallium and colobium and raising right hand in benediction, book of Gospels in left hand. Greek legend: ΙC ΧI. Reverse: Ornamented frame in the centre, Asomtavruli letters ႰႱႬ, Rusudan.